2. Are you a member? 3. Was your card issued on or after 1/1/2019? You can find your Rx letter code in the lower right corner of your member ID card (shown in the green circle below). If you don't have a letter on your member ID card, please log in to Blue Connect. Shots for Flu, Pneumonia and Shingles are now covered by your pharmacy benefits. Use this state-by-state list to find a vaccinating pharmacy near you. 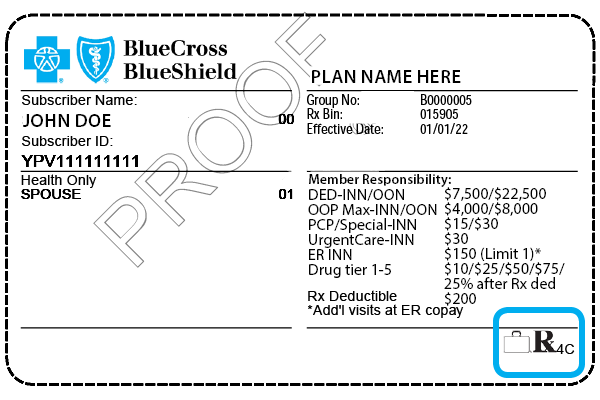 If you've been prescribed a specialty drug, you'll want to check the specialty drug list (pdf) to see if you must buy it at a Blue Cross NC network pharmacy. We've contracted with a network of pharmacies committed to better pricing to make sure specialty drugs stay affordable for our members. 1. Prime Therapeutics, LLC is an independent company providing pharmacy benefit management services. Medco Health Solutions, Inc. is an Express Scripts Holding Company. Please note that information from the Prime Therapeutics website is maintained and governed entirely by Prime Therapeutics and not controlled by Blue Cross and Blue Shield of North Carolina in any way.